A dog with a broken leg and pellet wound in his neck limps along a beach, helpless, wondering if he will ever be safe again. This poor pup has been abandoned on Dead Dog Beach, where people cruelly drop off animals they no longer want or can't care for anymore. Some dogs are in such bad condition that even if they wanted to, they couldn't leave. 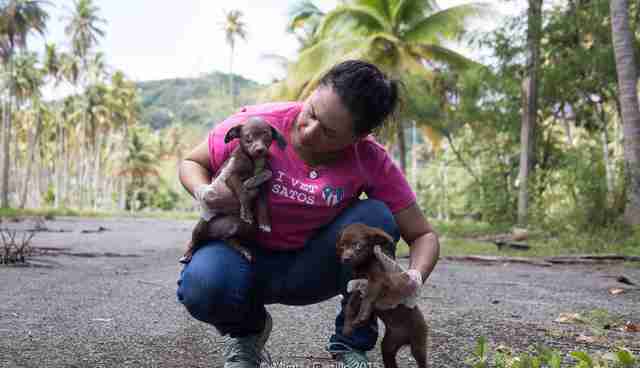 The real name of the beach, in Puerto Rico, is Playa Lucia, and while it used to be a popular spot for beachgoers, the only beachgoers who roam the sands now are packs of abandoned dogs - sometimes up to 300 at once. The plight of these abandoned and often abused dogs is heartbreaking - and one organization is looking to put an end to it. The Sato Project has so far saved 1,400 dogs from certain death by rescuing them and flying them to New York, where their forever homes await. Sato is Puerto Rican slang for "street dog." The founder of the project, Chrissy Beckles, runs a round-the-clock operation. "The last 12 hours have brought eight new members into The Sato Project," Beckles told The Dodo on Wednesday night. "Our volunteers patrol Dead Dog Beach twice daily and so any new dogs are immediately recognized." Among the dogs saved over the past day is the dog with a badly broken leg, a Shih Tzu puppy. Now named Erik after the tropical storm that recently flooded Dead Dog Beach, he had clearly been horribly abused throughout his life - and yet that didn't stop him from being so, so grateful at being rescued. 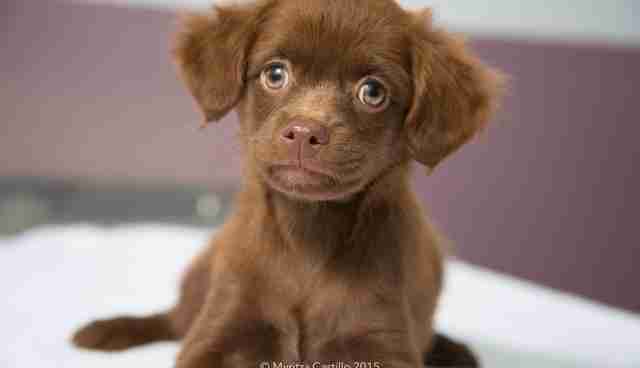 "I shudder to think that what this poor puppy has endured in his short life up until now," Beckles told The Dodo. 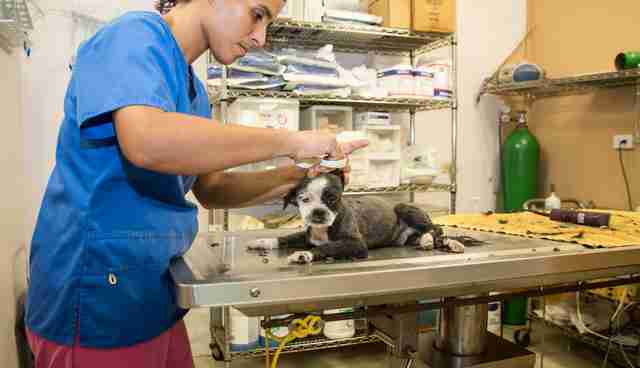 "His fur was matted and dirty and so we shaved him to reveal his tiny broken body. This little man did not struggle or bite. He gave kisses throughout the whole process." "The relief was evident on his little face," Beckles said. "I am safe now." 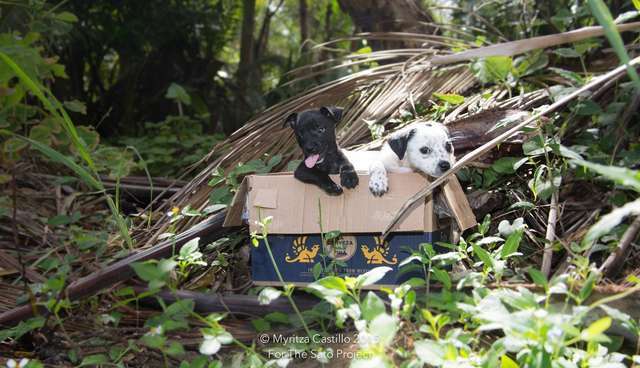 Around the same time Erik was rescued, six puppies were also found on the beach - dumped like trash in a cardboard beer box. "Four were already running around when we found them, wagging their little curly tails as we whistled and running to our open arms," Beckles said. The puppies are around 6 to 7 weeks old, and are what Beckles calls "pure satos" - born on the street and likely a mix of terrier and other dogs, often Chihuahua. All eight dogs rescued over the last day or so will stay in the care of The Sato Project for 9 or 10 weeks before making their "freedom flight" to New York City, where Beckles partners with organizations like Animal Haven. Erik, however, will have to remain with the project a little longer, as he needs special treatment for his orthopedic issues. Beckles is an avid boxer, and uses the sport to raise money for The Sato Project - quite literally fighting for these dogs' lives. Without The Sato Project, these dogs would never make it off that beach, and into the arms of their loving new families.